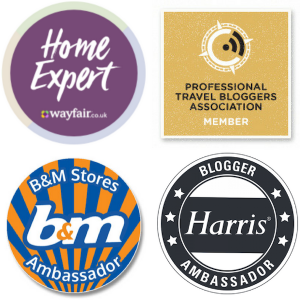 We all know that Christmas is just a ‘blink of an eye’ away (that’s how it feels anyway), and if you’re anything like me, you’re looking to save money on pressies by nabbing some great deals – and fast. But you probably also want to find unique gifts for your nearest and dearest; gifts that suggest you’ve put some thought into them and not just picked them off the supermarket shelves whilst doing the weekly shop. When I first heard that Sports Direct was setting a challenge to bag a Christmas pressie for a fiver, I nearly dismissed it out of hand. After all, the only time I visited Sports Direct was when the kids needed some new trainers or something for their swimming or rugby clubs. On the odd occasion, I’d also pick up some socks or pants for VIP that were readily available in baskets at the shop’s entrance. But curiosity got the better of me and I went online to see what they were talking about. And lo and behold, would you know it – they offer a whole heap of games, toys and novelty gifts – a lot of which isn’t sports related at all. More to the point, these were affordable gifts that I hadn’t before clapped eyes on – just the sort of thing that I was looking for to impress friends and family. In fact, I managed to buy four great presents for just £26, with two of them for a fiver each! Not bad going at all eh? And by the way, these are presents that I just know the recipients are going to love – let me reveal all! 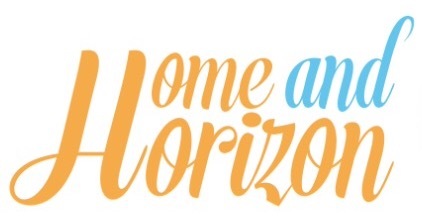 For my (almost teen) son, who is now at the age when he’s seeing a few changes – including rapidly gaining height on his 5ft 1” mum (much to his delight), then I know he’d appreciate some male grooming products to help ease him through the transitioning phase. 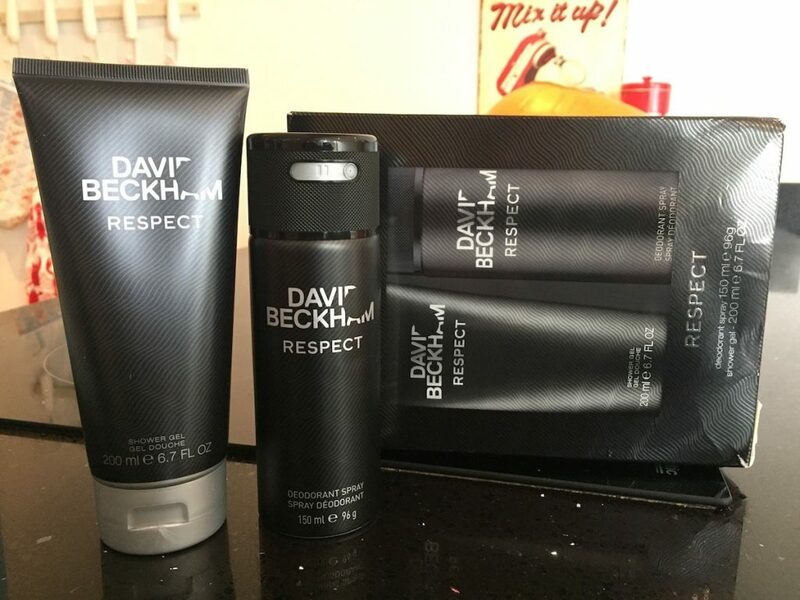 And what better than a (David) Beckham Respect Gift Set which includes a 150ml deodorant spray and a 200ml Shower Gel, both featuring top notes of zesty grapefruit, watermelon and pink pepper, with heart notes of basil, lavender and cardamom and base notes of vetiver, patchouli and moss. I’m sure he’ll feel very grown up and confident wearing that when he’s out and about (as long as the girls stay away – for now! ), says the over-protective mother. I picked up the Beckham Respect Gift set for just £6 (reduced from £9.99), but I noticed that the packaging was damaged on delivery. It’s nothing that some sellotape can’t fix, but I noticed there was a returns form in the delivery bag in case you are not happy with any of the products you purchased and want to return or exchange them. As it’s for my son, who’s usually blind to his dirty clothes lying on his bedroom floor, I doubt he’d noticed the packaging is damaged, so I’ll patch it up and give it to him, knowing that within nano seconds it’ll be ripped apart anyway! Almost every day I catch my tween daughter (aka Girlwrighter) pulling faces at herself in the hallway mirror; why do kids do that? In fact, I don’t think there has ever been a time when she has passed the mirror and not checked herself out pulling a silly face. And I won’t even go into how many hundreds of selfies I’ve seen on her iPad mini with her face contorted into all sorts of strange expressions! So when I saw this Selfie Triangle Selfie Booth Set I knew it was perfect for her – and that she’ll definitely be getting a whole load of use from it. 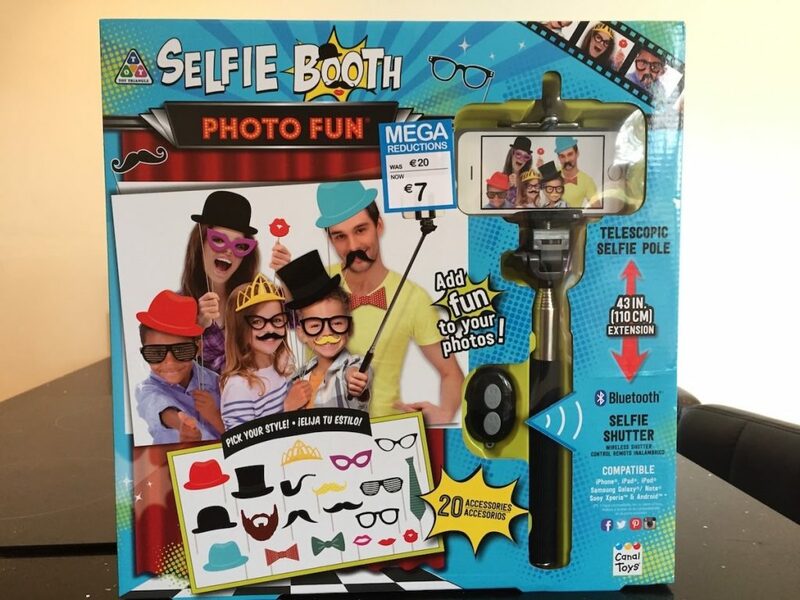 The set, which was bought for just £5 (reduced from £15) features a ‘selfie booth’, a telescopic selfie pole – 100cm extension (compatible with iPhone, iPad, iPod, Samsung Galaxy/Note, Sony Xperia and Android), a Wireless selfie shutter and 20 cool accessories. Come Christmas, she can pull all the faces she wants – as long as they’re not at me! Our neighbour, who we’ve luckily made firm friends with, has a six-year old son who is a huge outdoors fan. Even when it’s cold he’s either pottering around the garden looking for insects, bug catcher at the ready, or kicking a footie around for some fun. I really wanted to get him something to play with in the garden, but I’d almost given up on the idea as most outdoor games and activities he already possesses. And then I spotted the Wubble Ball, which looks like a whole load of fun. 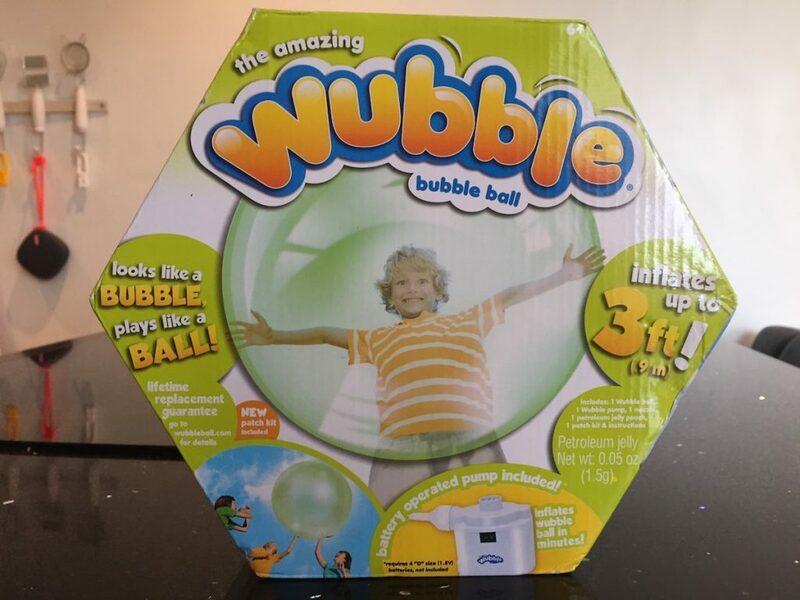 It’s basically a huge squishy, stretchy ball that you can inflate up to 3 feet (the pump is included) and it’s like one massive bubble that you can play with – pat it against a fence, kick it around and (if the kids are not too heavy! ), even roll over it. It sounded like something he’d really enjoy and get a lot of pleasure from – and I’m also betting that he didn’t know the Wubble Ball existed either, which will be brownie points for me. And the great thing was, it was £20 reduced to just £10. Unlike my daughter, who is a complete tomboy through and through, her best friend is a girly girl, who loves nothing more than dressing up, playing with dolls, baking – and drooling over crystals and gems. So I think this Grafix Creation Set will be the prefect present for her this Christmas, as she’s fascinated with gems and also has a book on crystals that we got for her last birthday, which she loved. 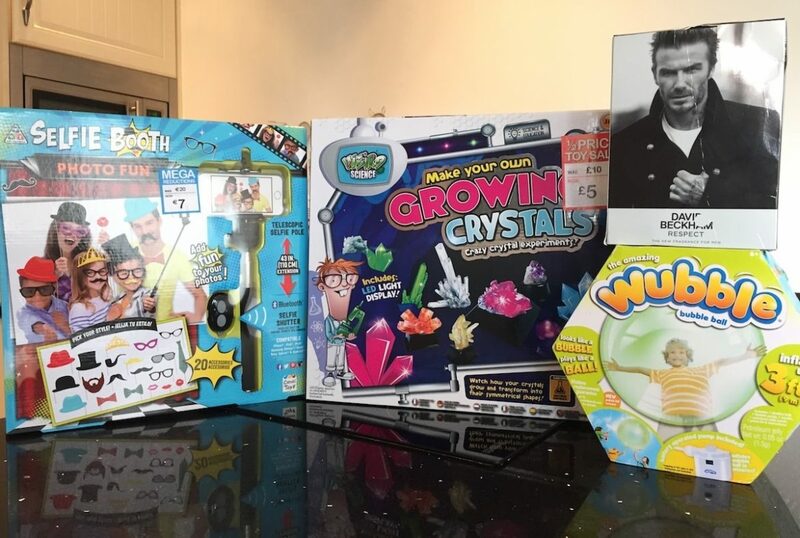 The Crystal Creation Science set has been reduced from £10 to a super affordable £5 and features seven mould shapes including a unicorn, star, shell, bunny, flower, butterfly and heart. It’s suitable for kids aged 10 years and over and offers the opportunity to carry out real chemical reactions. If you know someone who likes crystals and creating fun things – you can’t go wrong with a gift like this. And that wraps up my gift list for now from Sports Direct. What I particularly liked about the products I’d chosen is that they all seemed to be great quality. And it’s always nice to feel like you’re getting a great deal when gifts have been reduced in the run-up to Christmas; I have a feeling I’ll be popping in there a few more times before 25th December! By the way, if you do order online at Sports Direct, delivery is £4.99 – and that also applies to have it delivered to your nearest shop, so it makes sense to have it home delivered to make life that bit easier. Finally, I can’t leave out one very important person now can I? 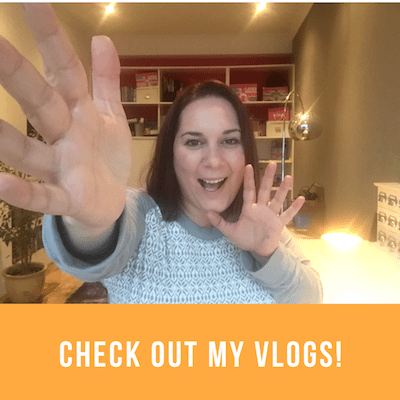 No, I’m not talking about VIP this time – I’m talking about myself! Whilst I was browsing the wide variety of gift online, I just so happened to come across one lovely little present that I wouldn’t mind receiving from Santa. 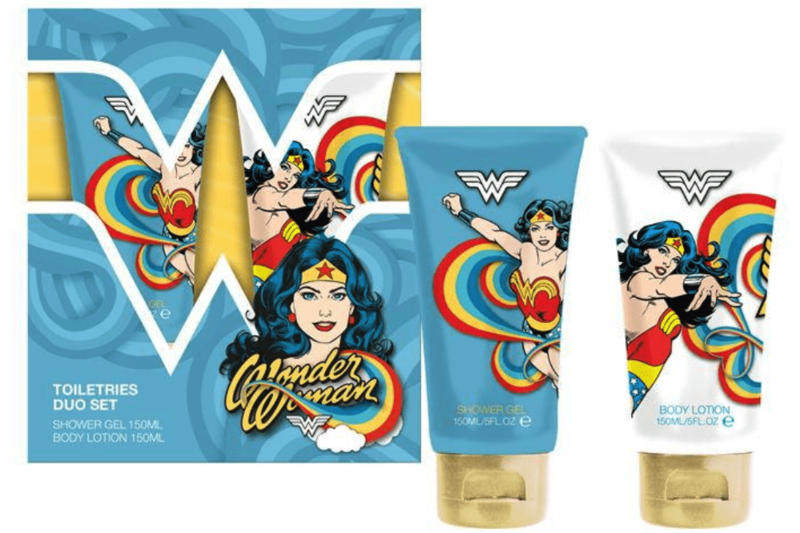 Now, I’m not going to do what I normally do and buy it for myself and then give it to VIP to wrap up for me, I’m just leaving a HUGE hint on this post (and hoping he’ll read it) that I love this Wonder Woman Toiletries Due Set that I spotted – all for just £3.49! Now if that isn’t a bargain, I really don’t know what is. Without giving away your present plans, what bargain gifts do you have your eye on? 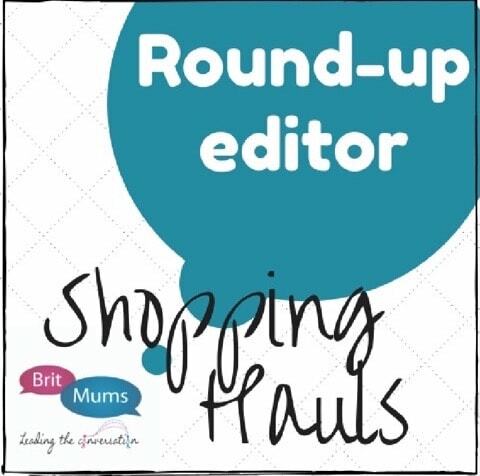 *I collaborated on BritMums' #sdfiverchallenge Christmas Challenge, sponsored by Sportsdirect.com. 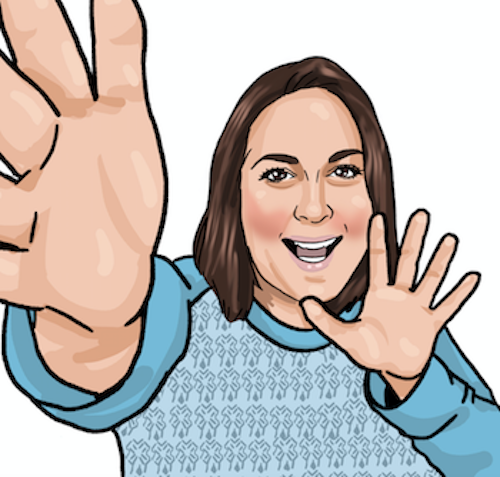 Great to hear it Claire – happy Xmas saving! Thanks very much – and good luck! With two sports mad boys, I seem to spend half my life (and money) at Sports Direct! I love all of the gifts you’ve chosen and will definitely be popping some into my virtual shopping basket next time I’m online – which will be very soon, I’m sure! Thanks Carol – I didn’t know myself that a lot of the gifts are great value for money, so some more pressies need to be bought for the stocking fillers! Enjoy Kara – let me know if you get a good bargain! They certainly have some great go-to bargains! All of these presents are so cool and different! I didn’t even know Sprts Direct sold half of these items! It’s great to be able to spread the word and enable more people to save money! Great finds. Meanwhile I’m still thinking on what to give to the mister and the kids. 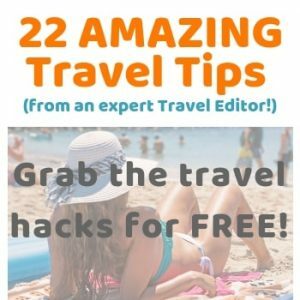 I think you need to do a bit of online browsing – that usually sparks off an idea – good luck! Wow those gifts look great! Had no idea sports direct did stuff like this! They’re great aren’t they Mary? Amazing what you can find where you least expect it! that’s great you now know what they offer! Fab gifts here. I need to round up my Christmas shopping. £5 is a great price for a quick pressie. It seems there’s a really good range of gifts on the Sports Direct site. I’ll certainly be taking a look for the festive season! Cheers Chris! Definitely worth a look! I had no idea sports direct did all these things either, I’m struggling this year for my eldest so I’ll definitely be having a look. I’m so surprised that all of these things were from SportsDirect and so reasonably priced! 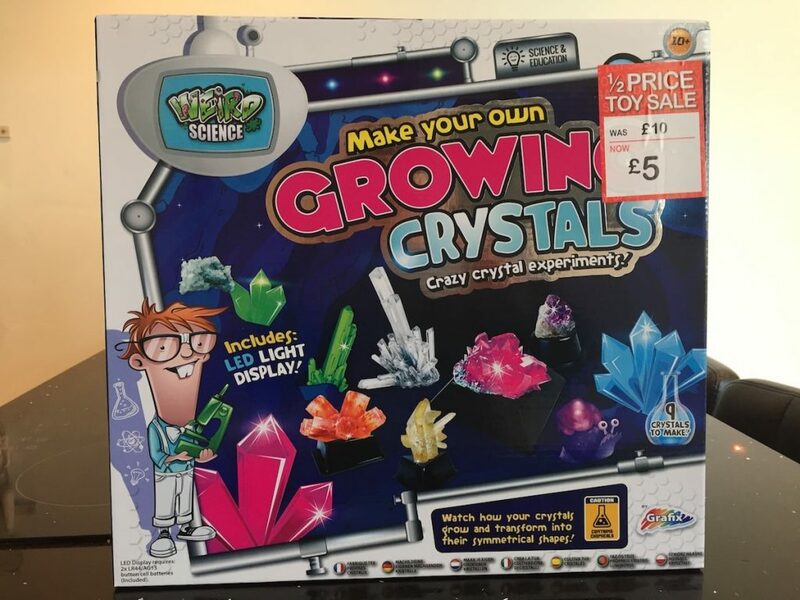 I would have loved that crystal growing kit when I was younger. Will definitely be looking here for presents for younger family members! Honestly had no idea of some of the things they sold – a pleasant surprise!